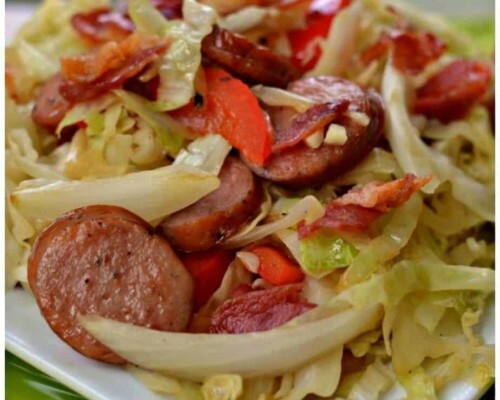 You are just a few minutes away from this delicious low carb Cabbage Stir Fry with Bacon and Sausage. This scrumptious recipe keeps things simple with just a handful of ingredients. Sometimes the simple recipes are the best ones! 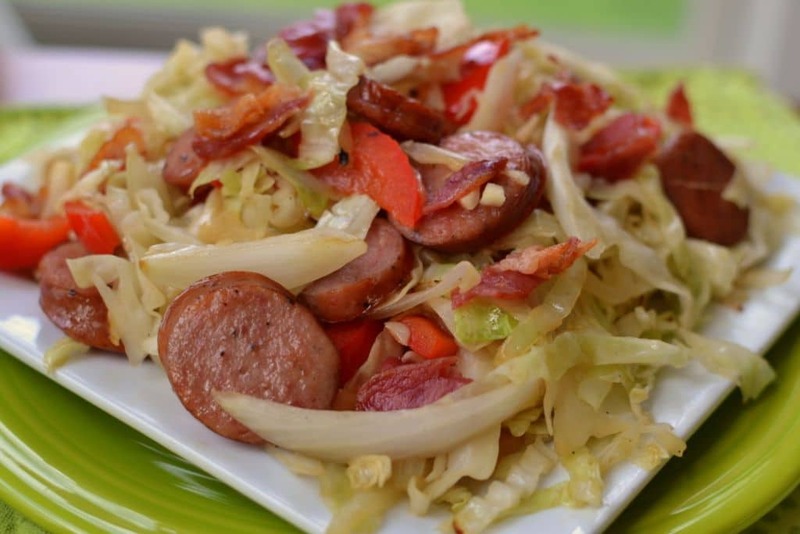 Quick to shop and quick to fix Cabbage Stir Fry with Bacon and Sausage is dependable and delectable every time. I am a huge cabbage fan. I just love it and there so many amazing ways to prepare it. Do you like cabbage? If so you need to try this easy fifteen minute recipe. There are numerous health benefits to cabbage. 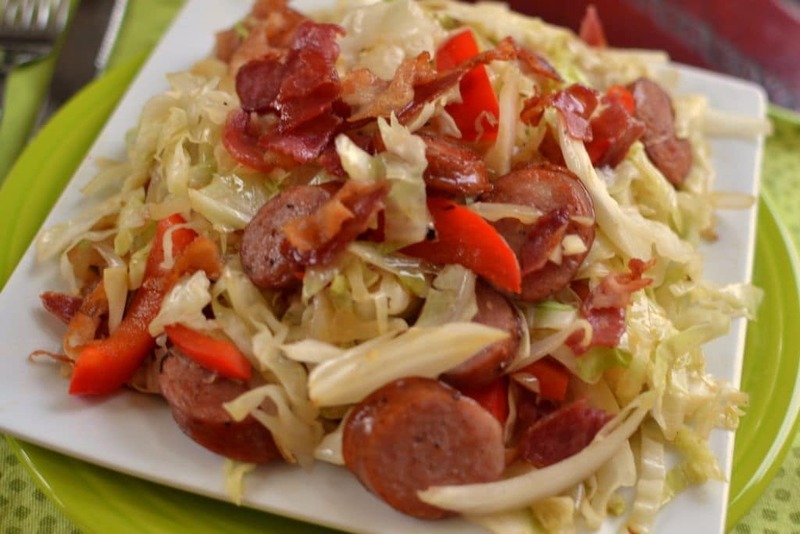 It is high in fiber, low in calories and carbs, and high in vitamins K and C.
How do you make Cabbage Stir Fry with Bacon and Sausage? Start by cooking the bacon until crispy. You can do this in the oven, large skillet or in the wok. If cooking in the wok do so over medium heat, rotate the bacon from the center out as it cooks. The pieces in the middle will cook faster. Remove to paper towels to drain. Once the bacon is cooled coarsely chop. Add canola oil to the wok and heat on high. Add kielbasa and cook until lightly browned. Remove to plate and add a little more canola oil to the wok and heat until just starting to smoke. Add the onion and the red pepper. Cook for two to three minutes stirring several times. Remove to plate with sausage. Add a little more canola oil and add the cabbage and cook three to four minutes stirring several times. Reduce heat and add the garlic cooking for one additional minute stirring constantly. Sprinkle the bacon over the top and salt and pepper to taste. Stir Fry is wonderful for achieving crisp cooked veggies but if you like your cabbage a little more tender than for goodness sake leave your veggies in one to two minutes longer. This super easy dinner can be prepared in fifteen to twenty minutes. It is a family favorite and my teen kids love it. It is low carb, keto friendly and one of my favorites. Helpful hints for Cabbage Stir Fry Recipe! Use oil with a high smoking point like canola, vegetable oil or peanut oil. Get the wok really hot and just to the smoking point. Don’t crowd the wok or skillet. Cook in batches and plate the sausage, peppers and onions. Garlic can not be cooked at high heat as it will burn. Once burned it tastes bitter. Add it to the wok with a larger group of vegetables that are done or almost done. Turn the heat down and cook for less than one minute. Stir fry moves very fast and needs your full attention. This is not the time to fold laundry or take a phone call. This Cabbage Stir Fry with Bacon and Sausage is best served immediately. Plan accordingly so everything is fresh out of the wok and hot. This delectable recipe is easy, quick, family friendly and dependable. Put the ingredients on your shopping list today and make you and your loved ones a wholesome filling dinner. I hope you love this recipe as much as we do! This post was originally published April 20, 2016 and was republished December 23, 2018 with new content. 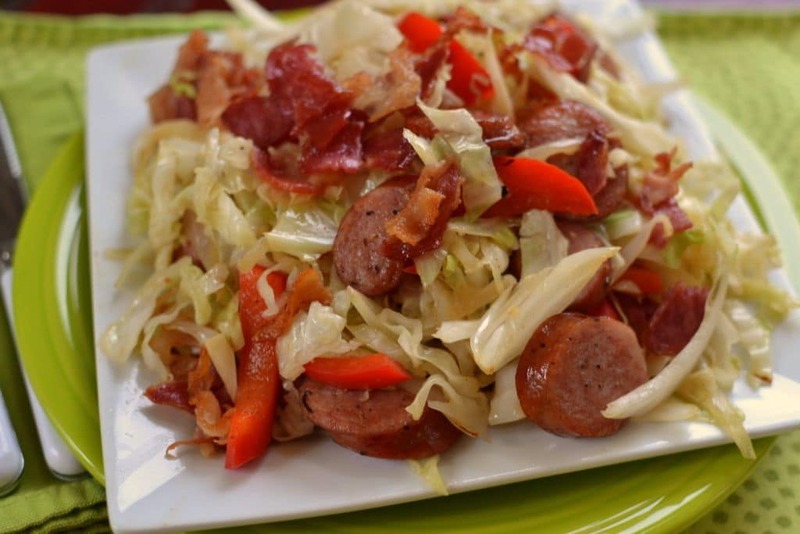 You are just a few minutes away from this low carb Bacon Sausage Cabbage Stir Fry. This scrumptious recipe is so easy with just a handful of ingredients. Cook the bacon in the wok over medium heat rotating the slices from the center out. Place on paper towels to drain and set aside. Add 1 tablespoon canola oil to wok and heat on high. Add kielbasa and cook until lightly browned. Remove to plate. Add 1 tablespoon canola oil to wok and heat on high until just smoking. Add onion and red pepper. Cook for 2-3 minutes stirring a couple of times. Remove to plate. Add 1 tablespoon of canola oil to wok over high heat. Add cabbage and cook additional 3-4 minutes stirring several times. Reduce heat, add garlic and cook for 1 additional minute. Sprinkle bacon over the top. Salt and pepper to taste. This was easy and good, especially if your watching your carbs. This has become one of our favorite dinners! It’s simple,quick, healthy and has amazing flavor! Thanks for sharing! So glad that you like it. The pleasure was all mine! Thank you so much ! This was a great meal , me and my boyfriend loved it ! Awesome! So glad that you liked it!